Opening: Who wouldn’t travel anywhere to get an apple or a pear? Summary: (from my library catalog) All the fruits gather together and enjoy a rhyming party, but poor Orange feels left out because he does not rhyme with anything–until Apple invents a new word..
Why I like this book: I want to believe Rex wrote this for picture book writers! So funny, so true, and writing in rhyme is SO hard! It’f fun and funny in all aspects and I really like the fresh compositions with mixed media. Great read aloud for a slightly older group of PB readers, maybe best for early elementary classes. Resources/Activities: Play rhyme games: stash a few objects in a bag and have participants reach in for one at a time and come up with a word rhyming with the object. Opening: There once was a boy. Banjo, his name was, yes, Banjo Cannon. Summary: (from the publisher) What happens if someone’s dinner decides that, well, it doesn’t want to be eaten? For a hungry little boy named Banjo and a savory sausage named Melvin, it’s a plight that can only result in a breathless escape — and what a chase it is! Off speeds the sturdy sausage — leading fork, knife, and plate, chair and table, a handful of fries with various French names, and three fat little peas — out the door, down the street, and around the park, with poor Banjo taking up the rear. Will the famished boy ever catch them? And what (gulp) happens to Melvin if he does? Why I like this book: Its fast-paced hysteria! The illustrations are as light, loose and fun as the text, and I especially like the addition of line drawings throughout the painted scenes. And with Thanksgiving on the way it’s time to think about food, where it comes from, and where it might…go! 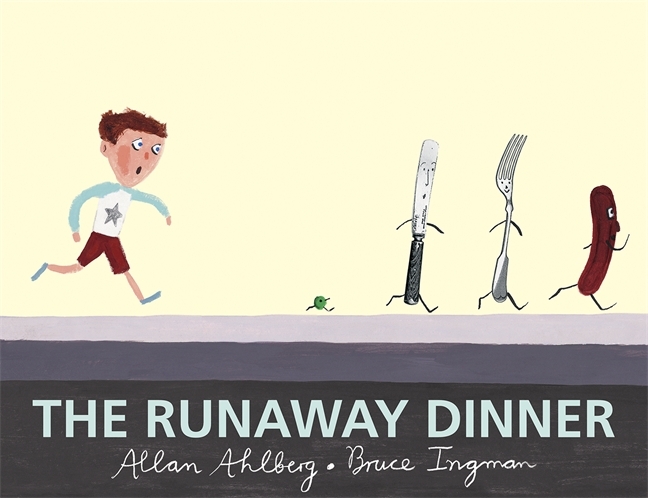 Resources/Activities: Amazon list of runaway food titles to compare and contrast; Lessons and resources: Where Does My Food Come From? From the Harvard Medical School Center for Health and the Global Environment. Visit Susanna Leonard Hill’s blog for more Perfect Picture Books, listed alphabetically, by title, theme, and age level, including resources and activity ideas for teachers.